The jet-ski had it's 10 year birthday this month and rewarded itself with a water leak from the exhaust manifold coolant jacket. The core plugs are welded in position and look to be sacrificial. 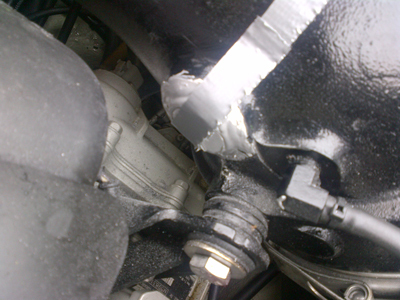 The conclusion on the forums is that a temporary repair could be effected using JB-Weld. So that's what I have done. For some added security I bonded on an 18swg aluminium disc (that's what the tape is holding on) before covering the whole area with more JB Weld. I thought I had checked all the other core plug positions for leaks but when I fired it up to check the repair I had a small weep from the plug located on the underside of the manifold, the most difficult one to get to as well. It was the beginning of hole, so out came more JB weld. 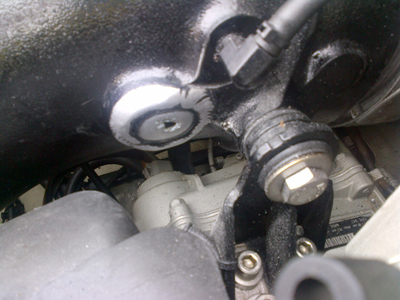 All appears Ok and I'm now on the lookout for a replacement manifold as this repair can only be considered temporary. But after 8 years of salt water use this isn't bad going.